After some of the recent spring storms, we’ve seen a lot of backlash on social media about shows being canceled due to inclement weather. As a company in the weather business, we know how difficult these decisions can be for event organizers. After spending months planning for an event, canceling it is never an easy call, but you need to put the safety of your patrons first. But what happens next? After you’ve made the call to cancel an event, what do you owe ticket holders? Is it your obligation to offer a refund, or are they out of luck? As we’ve said time and time again, you can’t really accurately predict the weather more than a few days in advance. So when weather-related cancellations occur, it’s typically at the last minute, after all of the work has been done – the venue has been paid, the equipment has been rented and the marketing budget has been drained. If you cancel the event, there’s no getting all that money back. Each advance ticket purchaser shall, until the performance of the event for which the advance ticket has been purchased, retain a property interest in that portion of the deposit which equals the amount he has paid for such advance ticket, and shall be entitled to a refund for such amount if the performance of the event for which such ticket has been purchased in advance has been cancelled or rescheduled, except as provided for by subdivision three of this section. The refund provisions of subdivisions one and two of this section shall not apply where (i) there was no material change in the time of the performance of the event or in the location at which the event was held; (ii) the performance of such event was rescheduled due to an Act of God, war, riot or other catastrophe as to which negligence or willful misconduct on the part of the ticket distributor who offered or sold such advance tickets was not the proximate cause and where the advance ticket purchaser was given the right to use his or her ticket for such rescheduled performance or the right to exchange such ticket for a ticket comparable in price and location to another, similar event; or (iii) the back of the ticket conspicuously states that if the performance is cancelled or rescheduled, the ticket distributor shall not be required to refund the ticket price if the ticket purchaser is given the right, within twelve months of the originally scheduled date of the performance, to attend a rescheduled performance of the same event or to exchange such ticket for a ticket comparable in price and location to another, similar event. 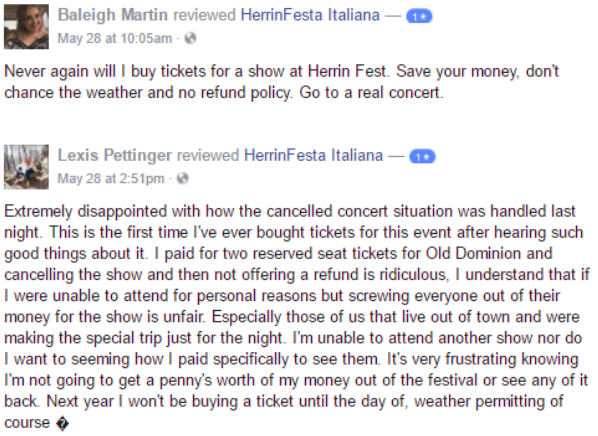 Herrin Festa, an eight-day festival in Herrin, Illinois, canceled the Old Dominion concert due to severe weather. 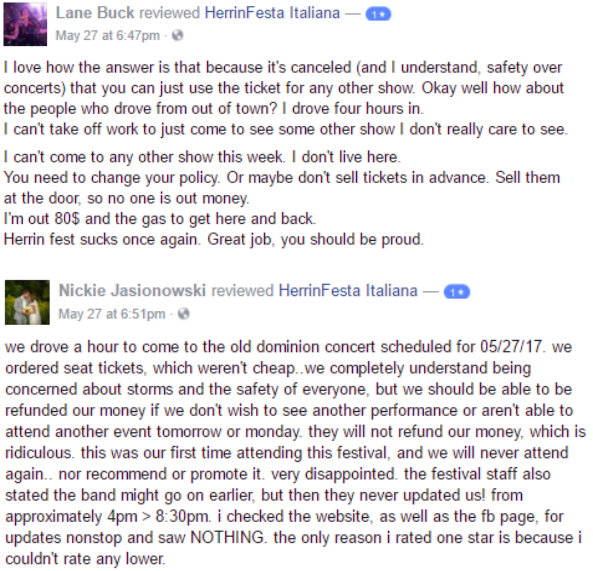 No refunds were given but those that held tickets could exchange them for tickets to either show on the next two nights. Those shows were George Thorogood and Halestorm. If you bought your ticket to see one of the hottest country bands, why is receiving a ticket to a rock or metal concert fair compensation? Not to mention, it’s likely many people traveled to town just to see Old Dominion and can’t move around their schedule to attend one of the other shows. Ticket holders understand the inherent risks of attending outdoor events. While they may be disappointed by the cancellation, only Mother Nature can be to blame. Event organizers also understand the risks of outdoor events and acted in the best interest of ticket holders, employees and performers by canceling the show. If you’re thinking event organizers are off the hook since they’re not legally obligated to issue refunds, you may be surprised by the power of public opinion. 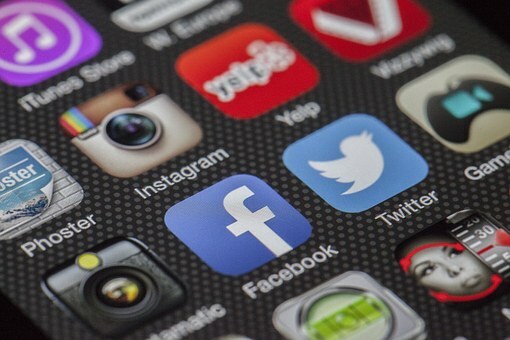 After feeling like they were cheated out of a much-anticipated concert without proper compensation, many outraged ticket holders took to social media to air their complaints. Not only does this negative publicity sour the reputation of the festival, which could affect future attendance, but it’s a loss for the industry as a whole. People who lost money on the tickets will be more apprehensive to purchase tickets in advance for other events, particularly outdoor events. By publishing their disappointment on social media, you now have a friend of a friend who heard about the event and they, too, will think twice before purchasing event tickets, especially advanced-purchased tickets. So the question becomes not can you afford to offer a refund, but can you afford not to? We understand that the event organizers need to protect their business and would lose significant profits if they issued refunds. However, it may have been worth it to avoid social media backlash and tarnishing their reputation. Fortunately, there’s a way everyone can win. With event cancellation insurance, ticket holders can get refunded and event organizers can protect their profits. Event cancellation insurance protects your event-related revenue or expenses against cancellation due to circumstances beyond your control. This includes more than just weather-related cancellations as well, such as terrorism, labor strikes, non-appearance of key people, and unavailability of the venue due to fires, floods, or power outages. To protect your revenues and your reputation, look into event cancellation insurance for your upcoming event. We can provide protection for almost every event held in the U.S.
Click here for more information on event cancellation insurance.